Without a healthy housing sector, the U.S. economy continues to motor along. Maximize employment – At 3.7 percent, unemployment is at a 49-year low. The Fed’s primary tool for steering the economy is monetary policy through control of the federal-funds rate, which now ranges between 2.0 and 2.25 percent. While above the near-zero rate experienced during the Great Recession and its recovery, interest rates are comfortably below the 5.7 percent average from 1971 through 2018. In its November meeting, the Fed held rates steady while indicating that another increase is probable before year-end. The long-term target, often referred to as the neutral level, is 3.0 percent. Fed officials believe further tightening is necessary to sustain GDP’s performance given the labor shortage, poor productivity, and trade policy. Taxes – Look for Democrats to push for an increase in recently-reduced corporate tax rates. Trade – The President’s trade deal with Canada and Mexico, replacing NAFTA, requires approval of Congress. Look for the Democrats to append provisions favorable to U.S. labor unions. Regulation – The Democrats will battle for retention of Obama-era regulations across the board, and the reversal of the President’s de-regulation efforts. Look for the White House to use de-regulation as a bargaining chip to achieve other Trump goals. Infrastructure – Republicans often oppose proposals that increase the deficit. The White House may get support from the Democrats in this area. Defense – Experts suggest that military spending is subject to cross-party disagreement which may result in lower defense budgets. Agriculture – Look for the White House to push its important bills through, during the lame duck sessions, before the new Congress is seated. Health Care – Action on drug prices and Obama Care will be limited by gridlock. The actions taken by Washington on these and other matters will reveal whether President Kennedy’s advice is taken. 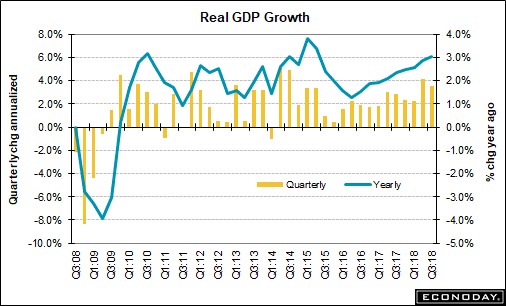 In 3Q2018, the U.S. economy grew by a 3.5 percent annualized rate as measured by GDP. The economy has grown by 3.0 percent over the last four quarters. That performance over a full calendar year last occurred in 2005. Yet the decline from Q2’s 4.2 percent* has economists worried that slower growth is ahead. The Wall Street Journal predicts a drop to 2.5 percent as early as 1Q2019. The Fed expects only 1.8 percent growth in 2021. Consumer spending continued to be the economy’s primary driver by jumping 4.0 percent on top of Q2’s 3.8 percent. Personal income tax cuts historically fuel the consumer for the two quarters following enactment, and then taper down over the eight following quarters. Low unemployment, stronger wage growth, and a healthy savings rate may prolong the impact of lower taxes. *Note that Q2 GDP of 4.1 percent reported in the August TrendTracker was revised upward. Government Spending - A $300 billion increase, approved by Congress and the White House last February, added 0.6 percentage points to Q3. This funding will phase out over the next year. Inventories - Businesses added $76.3 billion to inventories which contributed 2.1 percentage points to Q3. Without the inventory build, 3Q GDP would have come in at a weak 1.4 percent. Unknowns for future quarters are the effects of tariffs, counter-tariffs, and the stronger dollar. The U.S. has imposed $250 billion in tariffs on Chinese goods, and China has responded with $110 billion on U.S.-made purchases. As of the end of September, tariffs planned and enacted to date would reduce long-run GDP by $30 billion and eliminate 94,303 full-time equivalent jobs. 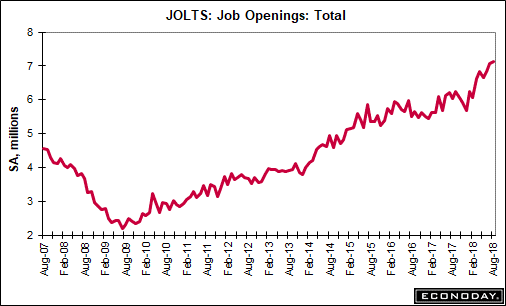 The U.S. economy continues to generate new jobs. Payroll employment increased by a whopping 250,000 in October. Last month became the 97th consecutive month of job creation – the longest streak on record.The headline Unemployment Rate remained at 3.7 percent, a 49-year low. 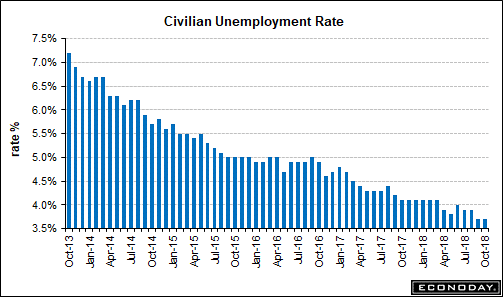 As noted in the August Update, the unemployment rate has been below 4.0 percent during only three occasions in the last 70 years: during the Korean War in the early 1950s, the Vietnam War in the late 60s, and the boom of 2000. In all three instances, recessions soon followed. The share of Americans working or seeking a job as measured by the Labor Force Participation Rate came in at 62.9, up 0.2 percentage points from September. This statistic reports the percentage of the working age population either employed or actively seeking a job. It reached an all-time high of 67.30 percent in January 2000. The Employment–Population Ratio increased 0.2 percentage points to 60.6 percent in October, and has risen by 0.4 percentage points in 2018. That’s the highest rate since January 2009, in the middle of the Great Recession but well below its peak of 63.4 percent reached in 2007. The Total Unemployment Rate declined to 7.4 percent, down from 8.5 percent a year ago. This metric, known as U-6, is based on a broader definition of employment status that includes (i) persons who are currently not working nor looking for work, but indicate that they are available for a job and (ii) part-time workers who want full-time work but have settled for a part-time position. Many economists consider U-6 the most accurate measure of the under-employed. In October the former category included 1.5 million, little changed from last year. The latter group totaled 4.6 million persons. The average hourly wage rose by 83 cents to $27.30 over the last twelve months, according to the October Employment Situation Report. That’s an increase of 3.1 percent. The average work week for all non-farm employees decreased by 0.1 hours to 34.5 hours. U-6, the Total Unemployment Rate, reporting only 6.1 million unemployed, we have quantitative evidence of the current labor shortage. To prevent the current economic growth from stalling, either existing workers must become more productive through training, or be replaced through automation. Unfortunately growth of output per man hour has fallen below 2.0 percent for 32 consecutive quarters. Such poor performance has never occurred in the post-World War 2 period. In the late 1990s and early 2000s, annual productivity growth routinely surpassed 3 percent. The recent tax cuts for business were designed to stimulate investment in equipment and machinery that yields higher labor productivity. With business investment declining in Q3, that inducement is not bearing fruit. Well-heeled companies like Amazon have raised their hourly minimum wage to $15. Under such a pay scale, many automated processes can be justified. Companies able to prosper with high wages have a competitive advantage when recruiting new hires. For the third consecutive year incomes have risen, while poverty has declined. Median household income increased 1.8 percent to $61,372 in 2017. The number of people living in poverty dropped to 12.3 percent, its lowest level since 2006. Incomes among Hispanics gained 3.7 percent, while the poverty rate fell to 21.2 percent. The poverty rate among blacks, 18.3 percent, was the lowest since 1972. Incomes have risen by 10.4 percent in the past three years. That rise is primarily due to people working more hours, rather than because wage rates have increased. 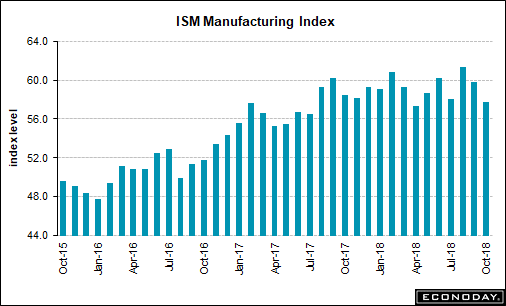 While still in positive territory, the October ISM Manufacturing Index came in at 57.7, down by 2.1 points from September. That performance marked the 26th consecutive month of growth in the manufacturing sector, albeit at a slower pace. Of the 18 industry sectors, thirteen grew in October, and four – Wood Products, Primary Metals, Nonmetallic Mineral Products, and Fabricated Metal Products – contracted. Foreshadowing a continued slowdown, New Orders fell below a 60 score for the first time since April 2017. Export Orders declined from 56 to 52.2. Production declined 4 points to 59.9, pulling down Employment by 2 points. Survey respondents are generally concerned about tariffs which are “causing shortages, triggering pre-buying, increasing import costs, and lengthening delivery times”. But overall activity in October as a whole, is considered a decline to a more sustainable level. Manufacturers created 32,000 new jobs in October, mostly in the durable goods sector. For the year, 296,000 production jobs have been added to payrolls. The work week slipped by 0.1 hour to 40.8 hours. Overtime went unchanged at 3.5 hours. Average weekly earnings has risen by 3.2 percent over the last 12 months to $912.73. Historically by now, the housing sector should be providing positive lift to the economy. 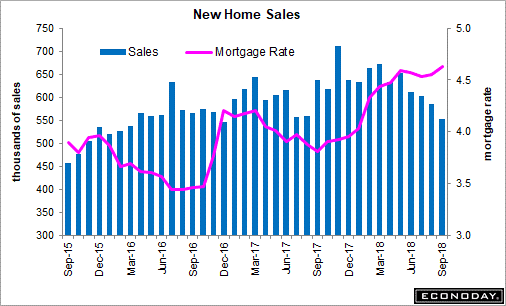 Plenty of jobs, moderate mortgage rates, a strong economy, and positive buyers’ attitude toward homeownership are in place. But simply put, there’s little demand. Purchase Costs: Affordability of ownership consists of two primary elements: the costs of the real estate and financing. The median price for an existing home was $258,100 this past September, and has risen 4.2 percent in the past year, and 50 percent since the market bottomed in 2012. The monthly mortgage payment required to buy the average-priced home has risen 16 percent since January. That’s much faster than the 3 percent rise in wages. Availability of the Right House: For the past ten years, U.S. homebuilders have chosen to build fewer houses than required to supply the rate of household formations. Further, they have shifted from building starter homes to larger, high-end houses that have higher profit margins. Not only are fewer choices available to first-time home buyers, but those buyers looking for move-up homes are also facing limited supply. The three housing charts clearly tell the story. September New Home Sales dropped by 5.5 percent from the previous month. The month’s annualized 553,000 unit sales was well below consensus. August activity was adjusted down by 44,000 to 585,000. With demand well below supply, the units that came on the market in September created a seven-month inventory, versus 5.3 months a year ago. Regional sales were mixed, with the West down 12.0 percent and the Midwest up 6.9 percent. Prices were flat for the month, with median selling price of $320,000 down 0.3 percent. Versus a year ago, the median is down 3.5 percent. 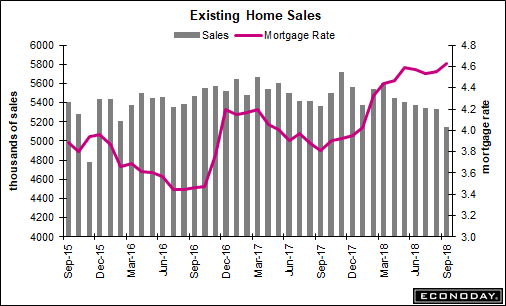 Existing Home Sales showed a similar story. In September, sales of this category fell 3.4 percent to an annualized rate of 5.150 million. This performance is the lowest rate of sales since November 2015. Sales of both single- and multi- family homes fell 3.4 percent. Weak demand is evidenced by the 2.8 percent decline in the median sales price. Real estate agents and housing economists believe prices could decline further in the near term. The inventory of homes on the market rose to a 4.4 month supply versus 4.2 a year ago. Equilibrium is considered a six-month inventory. 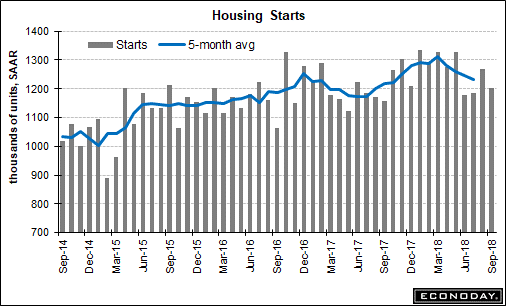 Housing Starts in September also met low expectations – down 5.3 percent to a 1.201 million annualized. Completions were very weak at 1.162 million annualized, down 4.1 percent and the lowest since last November. Hurricane Florence postponed construction in the South, with Starts in that region down 13.7 percent. But Midwest activity, which was not affected by inclement weather, fell 14.0 percent. Forecasts for September expected stronger issuance of Permits, but disappointed. With only 1.241 million, the month was the weakest since November 2017. 78 percent of the prospects believe renting is more affordable than owning, up from 11 percent six months ago. Reversing these numbers will take a significant attitude adjustment, particularly among Millennials and first-time homebuyers. Bottom Line: With the exception of a few key run-offs and recounts, the mid-term elections are behind us. But the campaign for the 2020 White House started on November 7 at 12:01 AM. More and more, politics dominates our individual and collective lives. Interestingly, the study of business, production, trade, labor, and the like was once called political economics. Political decisions, some wise, some not so much, impact every statistic that the TrendTracker Update seeks to interpret. In the U.S., those decisions are empowered by the will of the people through their votes and wallets. Being interested in politics is your duty as a citizen. Failure to do so risks settling for second best and, more importantly, the early demise of the Golden Goose.